A product from Nuance Communications, Inc. is a voice input and voice output program designed for use by individuals with spinal cord injury or upper extremity, vision, or learning disabilities. The program also permits hands-free mouse operation using MouseGrid technology. Users can create, move, edit, and format text by voice command in virtually all Windows applications, including word processors, spreadsheets, web browsers, and more. The program is integrated with Microsoft Word, WordPerfect, Microsoft Outlook, and Lotus Notes, allowing spoken text to appear immediately in a document. Select-and-Say editing permits editing by voice. Corrections can be made by voice or by keyboard, and corrections can be made immediately or delayed to a later time. The program also offers dictation playback, enabling the user to hear what he or she has written before editing. Text-to-speech capability also enables users to have their own documents or other files such as e-mail read aloud. 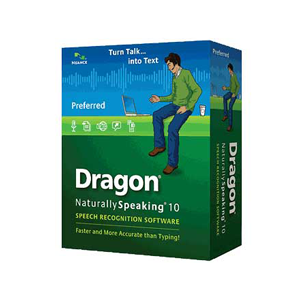 The program supports multiple users and each user “trains” the system as it is being used; the system learns accents, dialects, and individual pronunciations automatically.